This is Bucharest's most prestigious concert hall and one of the most beautiful buildings in the city. It was built in 1888 in neo-classical style after a design by the French architect Albert Galleron. 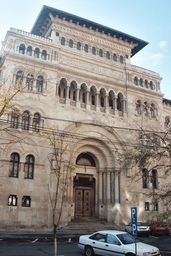 The project was conceived by the diplomat Constantin Exarcu and the money for the completion of the building were gathered in a public collection in which people were asked to "give a leu for the Atheneum" (The "leu" being the currency of Romania). With its 40 m high dome and the Doric columns it resembles an ancient temple. 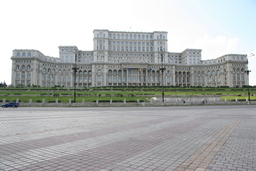 The beautiful facade is adorned with mosaics of five Romanian rulers. On the inside there are scenes from Romanian history. 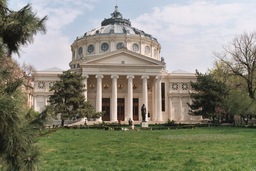 This is the place to hear classical music in Bucharest. The resident orchestra is George Enescu Philarmonic. Address: Piata Revolutiei (Revolutiei Square). This small church is one of the most beautiful in the city. It was built in 1724 during the ruling of Phanariot Prince Nicolae Mavrocordat by the Greek monk Ioanichie. 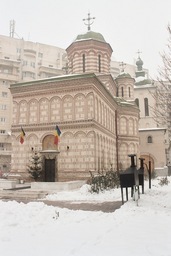 The church is representative for the Brancovenesc style which blends Ottoman and Western elements together with traditional Romanian architectural forms. The inside is equally beautiful, with wood and stone carvings and paintings and frescoes. Address: junction of Postei Street with Stavropoleos Street. The Village Museum was established in 1936 and it contains over 300 wooden houses, windmills, churches etc. from all over the country. If you don't plan to visit Romania's rural areas - and even if you do - you shouldn't miss this museum which is one of the largest of its kind in Europe. Many of the buildings are originals which were brought here in pieces and reassembled. The oldest houses date as far back as the 17C. Behind the project from the start was ethnographer Dimitrie Gusti (1880 - 1955) who wanted the museum to mirror as closely as possible the aspects of the rural life. Because of this the museum is organized as a real village, with clusters of houses being linked by winding paths. This makes for a pleasant stroll especially if you find yourself in Bucharest during the summer, when the city is hot and dusty. Sometimes the museum hosts crafts fairs and folk music and dance festivals. Address: Soseaua Kisellef 28 -30. The imposing building which used to be the Royal Palace is located in the Revolution Square (Piata Revolutiei), in the northwestern corner. 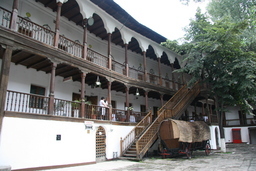 It was first built around 1815 by prince Dinicu Golescu and it underwent changes over several decades. The building was remodeled in 1882-1885 after plans by the French architect Paul Gottereau only to be rebuilt in 1930-1938 after being damaged in a fire in 1926. 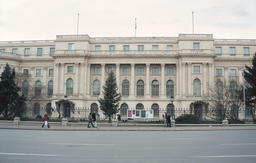 Starting with 1948 the palace houses the National Art Museum and it displays an extensive collection of Romanian and European art dating from the 15th to the 20th century. The building was damaged during the events of December 1989 and was closed for several years for repairs. Address: Calea Victoriei 49-53. 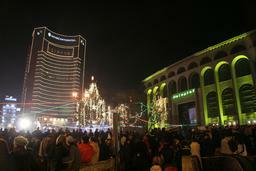 In the very center of Bucharest there is a place where one can take a break from Bucharest for a few hours. 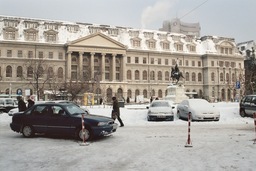 Cismigiu is located close to Universitatii Square, across the City Hall building. 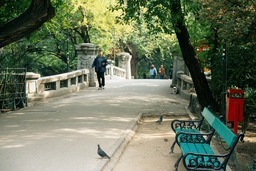 It is Bucharest's oldest park and a great place to stroll and enjoy the peace that one can feel finding such a place in the middle of a hectic city. Among the lawns and trees and the winding paths you'll find a lake with rowboat rentals, a beer garden, a playground for children, a chess area where old people play tournaments and plenty of park benches for relaxing and people watching. Sometimes there are Sunday concerts at the gazebo. Cismigiu was first designed and laid out in 1830 by the German landscape architect Carl Meyer, on the commision of Prince Gheorghe Bibescu, but it wasn't completed until 1860. More than 30,000 trees and plants were brought in from the Romanian mountains to be planted on the 17 hectares park. Address: Blvd Regina Elisabeta. 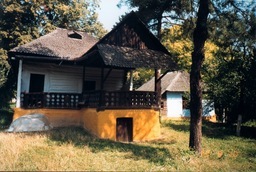 The Museum of Romanian Peasant is the winner of the European Museum of the Year Award for year 1996. A short visit to the museum will convince you that the award is well deserved. The collection includes 18000 pieces of pottery and 20000 examples of national dress from all over the country, as well as carpets, icons, furniture, photographs and films documenting the customs of rural life. But what makes it special is the way the collection is arranged; the museum looks more like an art gallery than a museum. The display information is hand written on pieces of paper or illustrated by freehand sketches. In one of the galleries you can see a wooden church and in another a wooden peasant house. They also have some beautiful "troite" (crosses placed at crossroads or at the edge of a village). 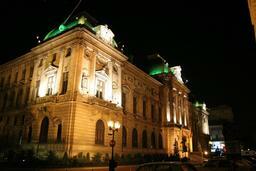 Manuc's Inn is the best preserved of Bucharest's old inns. It was built around 1808 to shelter travelling merchants. 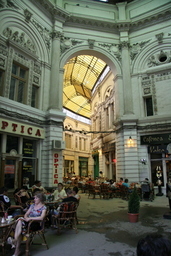 The inn is also one of Bucharest's historical building. Its owner, an influential Armenian called Emanuel Marzaian (better know as Manuc Bey hence the name of the place) offered the building for the signing in 1812 of the treaty that ended the Russo-Turkish war and resulted in the gain of Bessarabia by Russia. The treaty is known as the Treaty of Bucharest (1812). 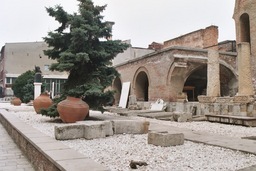 The building has the two tier galleries featured by the caravanserais that were common all over the Otoman Empire. Today, Manuc's Inn functions as a hotel-restaurant and winecellar. Address: Str Franceza 64. This beautiful building was designed in eclectic style by the French architect Paul Gottereau. Its construction began in 1894 on the site of a 16th century monastery Sf. Ioan cel Nou. This was the only bank that was allowed to do business during communism. Address: Calea Victoriei 13. 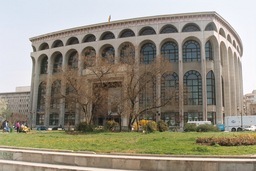 The stocky building sitting on one of the corners of University Square is the National Theater. It was built in 1973 after plans by a group of Romanian architects. The old building of the National Theater was destroyed during the WWII. Originally the building had a different facade, modeled after the architecture of Moldova's monasteries but in 1984 it was remodeled and got its present massive shape. The theatre has 4 performance halls. The National Theater is named after the Romanian playwright and short-story writer Ion Luca Caragiale (1852-1912). His plays made fun of the politics and politicians and of the Romanian society of that day. For example the play that is considered to be his masterpiece, "A Lost Letter", written in 1884, describes a provincial government election won by a blackmailer. It's amazing how his works have the same power today as they did a century ago. Not only that, but recently I saw one of his plays being performed in California and I was surprized to see how the American public of today can relate to his story written in 1880. Last, if you feel like having a refreshment, you'll find two bars located on top of the National Theater. One is a open terrace bar called "La Motoare", open only in summer, while the other one called "Laptaria lui Enache" is open during fall, winter and spring. They are usually crowded, especially in the late afternoon and evening and especially in the summer when it's difficult to find a table before 2AM in the morning. If you find a table, be prepared to share it. At Laptarie you can catch live music most of the evenings. On one of the corners of Piata Revolutiei, next to the former Royal Palace, lies the beautiful red brick Cretulescu church, one of the oldest churches in Bucharest. It was commisioned in 1722 by the boyar Iordache Cretulescu and his wife Safta, a daughter of prince Constantin Brancoveanu. The church is built in the style created by Constantin Brancoveanu, a seventeenth century ruler of Wallachia, who commisioned numerous buildings during his reign and set out to create a distinctive national genre of architecture. The Brâncovenesc or Brancovean Style blends Byzantine and Western architectural elements together with indigeneous forms. Another fine example of this style is Mogosoaia palace, outside Bucharest. 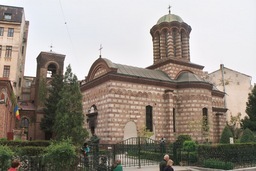 The church suffered damage during the 1989 revolution but was recently restored. The frescoes in the porch are especially beautiful. Inside there still can be seen fragments of the late nineteen century frescoes (1859 - 1860) done by Gheorghe Tattarescu, a great Romanian painter. To the side of the church stands a memorial bust of Corneliu Coposu who spent 17 years in prison for his anti-communist activities and was awarded the Legion d'Honeur by French government. Address: Calea Victoriei 45 A.
Calea Victoriei (Victory Road) is one of Bucharest's most charming streets. It was built as a main road in 1692 under orders from Constantin Brancoveanu who needed a road to link his palace at Mogosoaia with the Old Court. In the beginning the street was known as Podul Mogosoaia - Mogosoaia Bridge - because it was paved with wood. In 1878 after the Romanian War of Independence the street's name became Calea Victoriei. 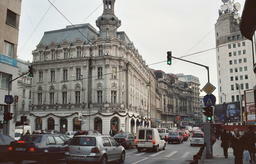 Between the two world wars Calea Victoriei became one of the most fashionable streets. Following this avenue from Piata Natiunilor Unite to Piata Victoriei you'll find some of the most beautiful buildings in Bucharest. 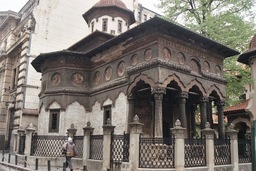 Among these are Stavropoleos Church - on Str. Stavropoleous, few second away from Calea Victoriei, the National Savings Bank or CEC building, the Art Deco Telephone Palace, the Cretulescu Church, the Central University Library, the Romanian Atheneum, the Royal Palace which today houses the National Art Museum and the Cantacuzino Palace. Bucharest University is dominating one of the corners of University Square. The old building, in neoclassic style is facing Regina Elisabeta boulevard. It was started in 1857 and finished in 1859. The buildings on the sides were built in 1912-1916. The University as an institution was created in 1864 by Alexandru Ioan Cuza, ruler of the newly united principalities, Wallachia and Moldova. All around the building you can find stalls selling secondhand books. Address: Piata Universitatii. In the last 15 years University Square has proved to be a popular railing point at the time of national crisis as well as celebration: people gathered here during the 1989 revolution and the sad events of June 1990 and they continue to gather here every time the national team wins a soccer game (which unfortunatelly doesn't happen very often these days). If you see a lot of people loitering around the underground passage entrance in front of the National Theater is because it's probably the most popular meeting place in Bucharest. It's a place buzzing with crowds and traffic, a true center of activity. 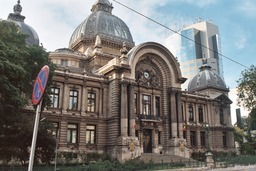 The square is surrounded by interesting architecture starting with the University of Bucharest building on the square's northwestern corner. Facing the university there are four statues of illustrious pedagogues and statesmen. 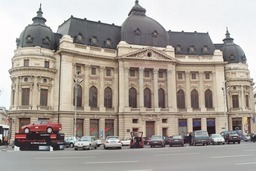 On the other northern corner, adjacent to the Intercontinental hotel, is the National Theater of Bucharest. Opposite it lies the beautiful building of the School of Architecture, behind a little square with a small fountain where people stop and sit when the weather is nice. On the southwestern corner of the square, the Bucharest History Museum traces the city history from the beginning to modern days and across from it lies the neo-Classical building of the Coltea Hospital and its lovely church. In the middle of the square, in a little island, there are ten stone crosses that pay homage to those killed during the 1989 revolution. Below the square there is an underground passage with shops and eateries which allows pedestrians to cross to from one side of the square to another and also leads to the subway station. The Union Square (Piata Unirii) is where the downtown starts. 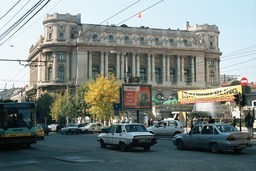 Two of Bucharest subway lines intersect here and the square is the site of one of the city's department stores, Unirea. Unfortunatelly this place was also Ceausescu's playground for experimentation, as the square was caught in his plan for "urbanization" and creation of the ugly soviet style Civic Center. To make way for his Civic Center Ceausescu ordered the demolition of all the buildings located in and around Unirii Square. The Brancovenesc Hospital, the Sf. Vineri Church, the Sf. Spiridon Church, the Vacaresti Monastery and many others historic buildings and monuments as well as lots of private houses were virtually wiped out. It's worth coming here and seeing the Civic Center just for realizing how ugly the architecture is (the blocks of apartments are just ugly, but the fountains along the Unirii boulevard are truly hideous). 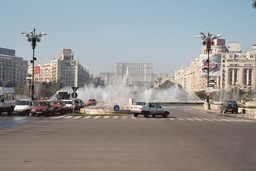 A few steps away from University Square, behind a little square with a fountain lies the building of the School of Architecture. Grigore Cherchez conceived this building in 1912 and it took five years to complete it. By circling the building you'll notice that it is a hybrid. The old wing (which is the one designed by Cherchez), in Brancovenesc style, is a mixture of Eastern and Renaissance motifs, with richly ornated pillars and carvings. This building was dedicated to Ion Mincu, which is considered to be one of the greatest Romanian architects. The new parts of the building are in a modern, cold style. 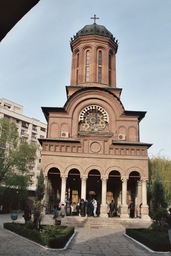 One of the churches located around Union Square (Piata Unirii) that survived Ceausescu's plan for creating the Civic Center is Princess Balasa Church (Biserica Domnita Balasa). Instead, this church had a bit of bad luck in terms of natural elements. The first church on this site was a wooden one built in 1774 but it burned down and was replaced by a stone structure in 1751. The second church was damaged during an earthquake and had to be replaced by a third structure build between 1838-1842. At its turn, this building was damaged by floods and replaced by a fourth church between 1881-1885. This is the ocre striped church that we see today. The current church had to be repaired again after each of the two major 20C earthquakes (1940 and 1977). This is one of the most popular places for weddings in Bucharest and if you come here on Saturdays and Sundays, you are almost certain to see a wedding taking place. The church is located off Piata Unirii and Splaiul Independentei behind the blocks of apartments bordering Unirii Square, and faces the side of the Justice Palace. 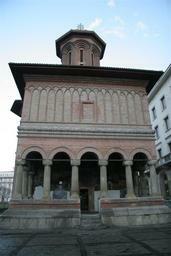 Princess Balasa Church is named after Wallachia's ruler Brancoveanu's sixth daughter. Her statue stands in the small garden that surrounds the church. Villacrosse and Macca passages are two pedestrian alleys roofed with glass and wrought iron and lined with shops, cafes and restaurants. They were built at the end of the 19th century. 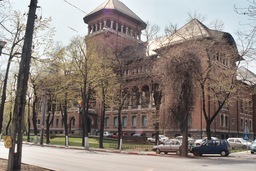 Entrance from Calea Victoriei across the police headquarters and from E. Carada Street. In northern Bucharest, along Sos. 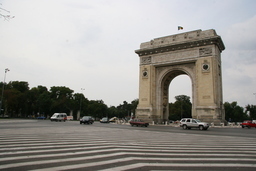 Kiseleff lies Bucharest's Triumphal Arch (Arcul de Triumf). Modelled on the triumphal arch in Paris, the structure was erected in 1935-1936 to commemorate the creation of Greater Romania which took place in 1918. It sits on the spot where two earlier arches stood: the first arch made of wood and cardboard was erected in 1878 to mark Romania's independence from the Turks; the second arch made of timber was erected in 1922 to mark Ferdinand's entry into Bucharest as the first king of Greater Romania. The current arch is built of concrete and granite. Portraits of King Ferdinand and Queen Marie decorate one face, while the names of battles fought by Romanians during the First World War can be seen on the other face. The portraits of the king and queen were destroyed during the communist rule but they were restored in 1992. The sculptures decorating the arch were created by leading artists of the day, including Ion Jalea, D. Onofrei and Constantin Baraschi. 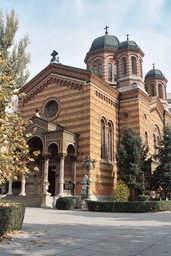 The reasons that make me include so many churches in my must see tips on Bucharest are two: first, many churches are among the oldest and most beautiful buildings in the city and second, many of the churches have a very interesting history. That is the case for example with the New St. Gheorghe Church - Biserica Sfantul Gheorghe Nou - which was built between 1705-1706 and holds the tomb of its founder Constantin Brancoveanu. Brancoveanu was Wallachia's ruler from 1688 - 1714 and his political and administrative sharpness brought the country into a period of stability, economic prosperity and cultural boom. Because of his anti-Turkish policy of forming alliances first with Austria and afterwards with Russia, he was denounced to the Ottoman Porte, dethroned and brought to Istanbul. There he was tortured by the Turks and he and and his four sons were beheaded on August 26, 1714. His wife had his corpse exhumed in secret and smuggled back into Romania. She reburried him in secret in the church's court. Because she didn't want the Turks to find out where Brancoveanu was burried she only marked the tomb with a stone, but she had a silver votive light made on which the inscription reads that the New St. Gheorghe Church is the place where voyevode Constantin Brancoveanu was burried. If you feel that you can't have enough of the communist architecture, here is another gem that you can admire. I hope that you can sense the sarcasm in my tone; if not, I want it to make it clear. This one was built in the 1960. You can find it behind the National Art Museum (former Royal Palace). 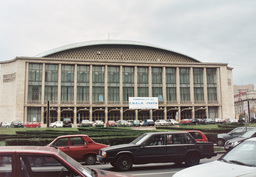 The building was used to host the five-yearly communist party congress.Today it's used as a big venue for concerts and exhibitions. 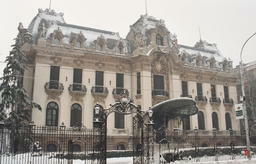 The National Bank of Romania sits on the site of one of the most famous buildings in Bucharest, Hanul Serban Voda (Serban Voda Inn) which was located here between the years of 1678-1883. In 1883 work began on the National Bank building, after a design by the French architects Cassien Bernard and Albert Galleron. 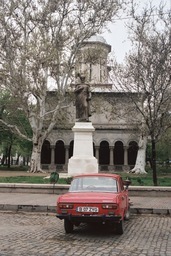 The building has a French Neo-classical style, with a facade with Corintian columns, and 4 statues representing Agriculture, Industry, Justice and Commerce.